Today we take time away from Luke’s Gospel to celebrate the Feast of the Epiphany, as told by Matthew. Today, the Church remembers the visit of the Magi to the infant Jesus. Epiphany is special to me because it is the anniversary of the date when Bishop Ralph ordained me as priest. The ordination ceremony took place at St James’ Fergus, where I was curate. It was incredibly exciting for the parish. I was their first curate ever, and it was also their first ordination ceremony ever. ‘Epiphany’ comes from a Greek word that means an appearance, especially the making apparent (manifestation) of a god. In Christian tradition, the Magi were the first Gentiles – the first people outside the Jewish family – to recognize the divinity of the baby Jesus. You might say that in bringing their gifts of gold, frankincense, and myrrh, the Magi were guests at Jesus’ baby shower. But it wasn’t really like that at all. 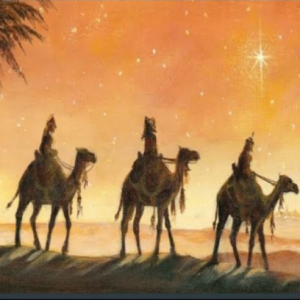 How many wise men were there and how did they travel? Let’s think about the old carol, We Three Kings, and Matthew’s story of the visit of the wise men. Matthew does not say that there were three wise men, only that they brought three gifts. We just assume that they brought one gift each. Now “everyone knows”, from Christmas cards and Christmas pageants as long back as they can remember, that the wise men arrived on camels. But the Gospel story doesn’t actually tell us how the wise men got to Bethlehem. Does this mean that we should tear up all the Christmas cards that we receive that show three kings on camels? I don’t think so. These additions are just part of the charming way that we have embroidered the story to make it more alive to us. We learnt the story as children from the tableaux of Christmas pageants rather than from the exact words of Scripture. Christmas pageants cheerfully mix together the shepherds and angels of Luke’s Christmas story with Matthew’s Magi. The new story is our present-day mythology. Mythology invites us to look at the meaning of the stories in the Bible rather than focus only on the superficial details. All this should alert us to the fact that the visit of the Magi may not have happened precisely as Matthew wrote it, either. Matthew wrote his Gospel about 80 years after Jesus was born. People had told and retold the story by word of mouth before it reached Matthew. They had almost certainly embellished and elaborated it by the time that Matthew heard it. We don’t know exactly who were these people call the Magi. Maybe they were astrologers. The important thing to know is that they were people seeking God. And that is what they found. 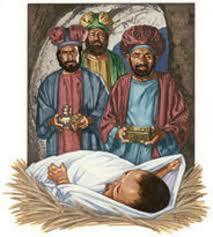 The Magi were of high status, yet they came to offer gifts to a mere baby, born to a poor peasant teenager. They brought expensive gifts – gold, frankincense, and myrrh. 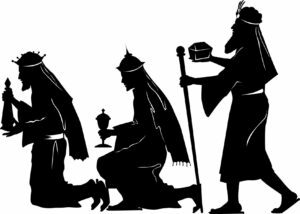 The hymn We Three Kings reminds us that the gifts were symbolic – gold for power and wealth; incense for holiness; myrrh predicting Jesus’ death. Yet when they looked into the eyes of that tiny baby, they saw the Christ – that is, divinity – looking back. That was the gift that they received in exchange. It seems to me that the word ‘gift’ implies no requirement nor expectation for reciprocity. That’s not the way that many of us exchange gifts at Christmas. If I buy a gift for Uncle Albert, I may feel upset if he does not give me a gift, too. There was a good article on that subject in Saturday’s Globe & Mail (January 5). Drug company ‘reps’ often give small gifts to doctors. Ostensibly these gifts have little value — pens, coffee, sandwiches. But the drug companies know that human beings have a powerful urge to reciprocate. Doctors, being human, are more likely to prescribe the drugs made by the company that gave them such ‘treats’ than similar products made by competitors. Because we should not get hung up on the details of the Epiphany story, we ask ourselves what the story means to us today, here in Milton at the beginning of a new year 2019. The Magi came from the East with their gifts for exactly the same reason that we have all come to church this morning. All of you here today are the Magi of the year 2019, for you have come to pay your own homage to the Christ-child. But more than that, who are the Magi in our lives and what gifts do they bring us? Conversely, who are the people to whom we are the Magi, and what gifts are we carrying for them? Like the New Year, the stories of Christmas and Epiphany express hope. That is why the New Year is often depicted like a newborn child. It is a symbol of a new year as a new start. As Christians, we believe that the birth of Jesus was a fresh start in the relationship between God and humanity. People make New Year resolutions in that same spirit – the hope that 2019 will better than 2018. I’ll resolve to lose weight, I’ll be nicer to my in-laws, I’ll come to church more regularly, or whatever. Therefore New Year resolutions are a bit like gardening or farming. When we plant our flowers, vegetables, or crops each spring, it expresses our hope and expectation that this will be the perfect summer. There will be just the right amount of rain and just the right warm temperatures. Today I want to repeat something I recounted several years ago at Epiphany. It is O. Henry’s charming story of love The visit of the Magi. I first encountered it as read by the late Alan Maitland in his role as Fireside Al on the CBC program As it Happens. Jim and Della were a poor young couple who had no money to buy each other Christmas presents. Jim’s most treasured possession was his gold watch, and Della’s was her long brown tresses. Jim longed to buy Della a set of tortoiseshell combs for her beautiful hair. Della longed to buy Jim a gold strap for his cherished watch. In the story, Jim sold his watch to buy Della the tortoiseshell combs. Della sold her hair to buy Jim the gold strap for his watch. But when they exchanged their gifts on Christmas morning, Jim had no watch to hang on the strap, and Della had no long hair through which to run the combs. “The magi, as you know, were wise men – wonderfully wise men – who brought gifts to the Babe in the manger. They invented the art of giving Christmas presents. Being wise, their gifts were no doubt wise ones, possibly bearing the privilege of exchange in case of duplication. And here I have lamely related to you the uneventful chronicle of two foolish children in a flat who most unwisely sacrificed for each other the greatest treasures of their house. But in a last word to the wise of these days let it be said that of all who give gifts these two were the wisest. O all who give and receive gifts, such as they, are wisest. Everywhere they are wisest. They are the magi.” So may we at St. George’s be Magi in this place!